Why wait until Thanksgiving weekend to save HUGE? Get an incredible assortment of awesome Pathfinder Roleplaying Game products right now and for the entire month of November! 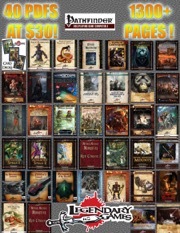 Featuring nearly 1,400 pages of Pathfinder products for just $30—almost 90% off the cover price of over $270—this bundle brings you over a hundred marvelous magic items, 100+ magnificent monsters in deliciously deadly detail, tons of new feats and spells and character options and new rules subsystems, ready-to-play characters, and 14 complete adventures running the gamut from 1st level to 13th level! Sample a wide variety of genres from the Far East to Ancient Egypt, from the rollicking south seas of the pirate isles to fey-haunted forests, and spectacular sci-fi/fantasy mash-ups from far-off worlds of adventure to postapocalyptic wastelands! Available now through November 30th! 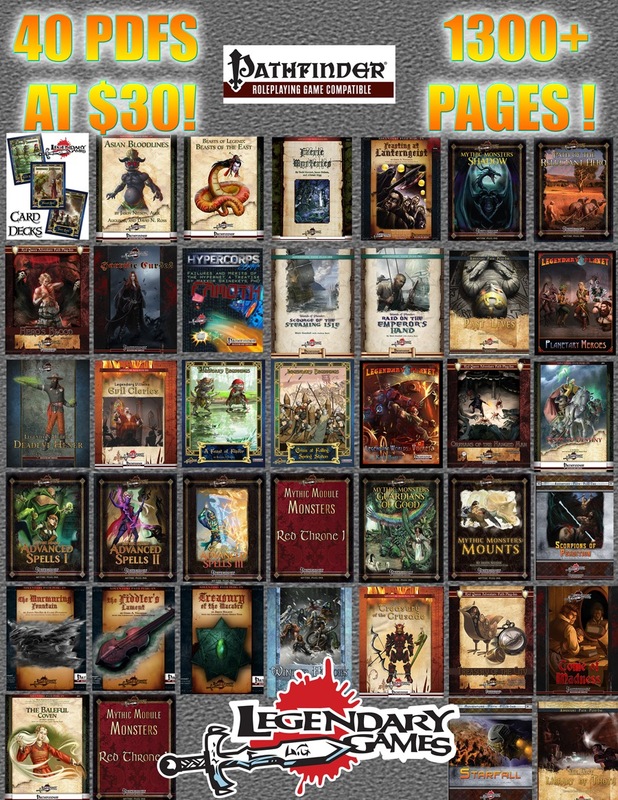 Woohoo, save HUGE on a giant pile of Pathfinder PDFs! oh my this is amazing!! HALFWAY HOME IN THE MONTH OF NOVEMBER! Get this spectacular savings now through November 30th! You should totally leave a review! Tick, tock, the savings end Thursday night at 11:59 PM! uhm Jason, I will, but I didn´t buy this one (most of this i have it already). Perhaps a review of every item that I have from your products would be better. In celebration of our 7th Anniversary, you can get this incredible bundle at nearly 90% OFF from now until April 7th! When the 7th is gone, the savings are gone too! The sale ends Saturday at midnight - come and get it now! Midnight at the end of the Saturday, Pacific DS Time? It's available again for our BACK TO SCHOOL BUNDLE BONANAZA! As well as two MORE Mega-Bundles for Pathfinder and three for 5E too!